Andy Akinwolere [shown above] was born in Nigeria in 1982 and eventually became a British television presenter. His first job was as a runner for the BBC and began co-presenting the BBC television program Blue Peter, the most established children’s programme in the country, in 2006. While he was nominated for awards, swimming was not among his myriad talents. In fact, Akinwolere was unable to swim a length in a pool and was absolutely terrified of the open water. But he faced his fears and soon started to learn a new skill. With a committed mindset, he eventually swam in the greatest depth in the ocean (27,976 feet or 8,524 meters) for an organized open water swim. Akinwolere swam 8.6 km across the Palau Trench, a deep abyss in the Pacific Ocean, one of the deepest stretches of water on the planet. 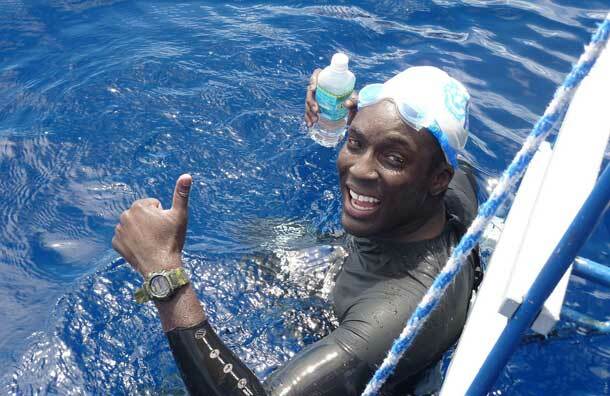 Remarkably up until a few weeks before his record swim, Akinwolere was certifiably a beginner. But he began his swim in the middle of the Pacific Ocean at 07.46.456 N by 134.57.35 E and swam 8.6 km until he reached 07.50.893 N by 134.57.347 E in a time of 3 hours 14 minutes. Akinwolere said, "It's an absolute triumph to have completed this swim, after having had just over 10 weeks of swimming training I still cannot believe how far I've come. I could not swim a length before this and now I have swum over one of the deepest parts of the world. All the hours of gruelling training will be worth it if my challenge inspires more children from ethnic minorities to learn to swim." That is exactly what Harvey Welch Jr. did in Carbondale, Illinois. Welch serves his community in ways that have been frequently recognized by his fellow citizens, fellow administrators at Southern Illinois University, and the City of Carbondale over the course of his career. In addition to being a driving force behind the Carbondale Park District, Welch serves on many boards and committees in the city (e.g., Police & Fire Commission, the Science Board, The Non-Bargaining Personnel Committee and the John A Logan Museum Board). But he was also recognized with the third Blue Mind Award for his inspiration and drive to establish a local aquatic complex where the opportunity for everyone to swim or at least learn how to swim was provided. "I was angry and I did not become the man who I could have become," admitted Welch while reflecting upon his life to Dr. Wallace J. Nichols when he was given the Blue Mind Award. Welch was not allowed to swim in pool when he was younger and he greatly missed that opportunity. But his campaign enabled a pool to be built so future generations would not be denied such an opportunity. But it was not an easy road to success. Welch and his colleagues had to overcome financial difficulties to get the pool built. So they came up with an innovative concept of selling blue light bulbs to the community. People would purchase the overpriced blue light bulbs and then place them on their front porches in a sign of support for the program. The blue light program worked as the community got behind the fundraising drive. The budget was reached and the pool was built, further adding to Welch's legacy. The ability to safely and enjoyably be in, on and under water came to Carbondale with the push by Welch.